In this study, we demonstrate that a message about climate change can have different effects depending on geographical location. 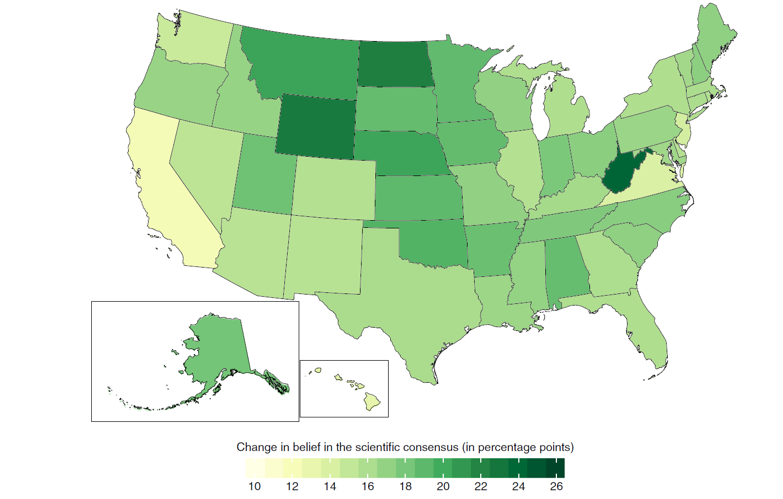 The research integrates two of our recent scientific advances: the importance of public understanding of the scientific consensus on climate change and new techniques that can estimate public opinion at state and local levels. When this message treatment effect was downscaled to state and local levels, we found that several fossil fuel-producing parts of the country exhibited the strongest positive response (see map below), especially West Virginia, North Dakota, and Wyoming. The consensus message led to a convergence of perceptions about the scientific consensus among conservatives and liberals. Experimental treatment effect sizes for each US state. Difference in change in belief in the scientific consensus between the treatment group, who were exposed to a message about the consensus on human-caused climate change, and the control group, who were not. Our prior research found that messages conveying the scientific consensus on climate change led members of the public to accept other important beliefs about climate change, including that it is happening, human-caused, and worrisome. This new study finds that while this message works everywhere, it is particularly effective in traditionally dismissive parts of the country. The study was conducted by researchers from Yale, Cambridge, UCSB, and Utah State University and funded by the Energy, Grantham, and MacArthur Foundations. Zhang, B., van der Linden, S., Mildenberger, M., Marlon, J., Howe, P., & Leiserowitz, A. (2018) Experimental effects of climate messages vary geographically. Nature Climate Change. The article is available here to those with a subscription to Nature Climate Change. If you would like to request a copy, please send an email to climatechange@yale.edu, with the subject line: Request Experimental Effects Paper.